What do you do when you are in a food rut? What do you do when you are in a blog rut? Eat? Cook? Starve? Read a book? I don’t know what’s wrong with me, but lately I didn’t feel very motivated to blog. I felt that it was too much effort to develop a recipe, write it don’t take pictures, think up a blog post, etc. This week I didn’t cook much and instead was living on sandwiches and smoothies. When I did cook, I tried to keep the recipes as simple as possible and most of my meals were made with the help of a little convenience food here and there. I am trying to pull myself out of that hole right now by easing into blogging again with the help of other bloggers. There are so many wonderful blogs out there and many take so much time to post their recipes online. There’s an awesome giant free cookbook available on the internet and I am almost never using the opportunity to try some of those recipes. Usually I am way to absorbed by my own recipes. This week I looked a bit closer at other blogs and bookmarked some recipes that I would like to try. 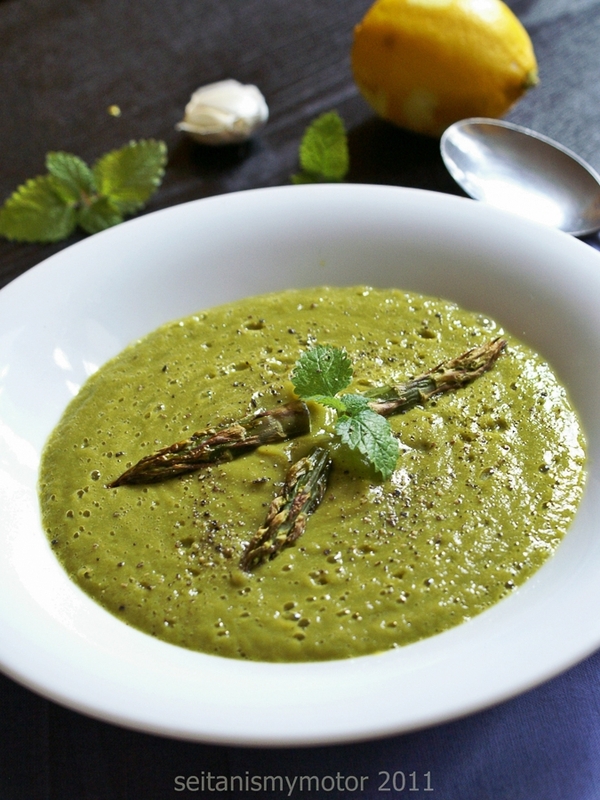 I started with this really delicious roasted asparagus soup from Fatfree Vegan. I adjusted the recipe a bit by roasting the asparagus with a bit of olive oil. I also added some lemon balm while puréeing the soup as well as some lemon juice and nutritional yeast. Heat oil in a pan. Fry onion and garlic for 2-3 minutes or until translucent. Add mushrooms and fry for 10 more minutes (medium heat). Pour pumpkin seed mixture into the pan, stir, add nutritional yeast. Stir until smooth. Season with salt and pepper. Set aside. 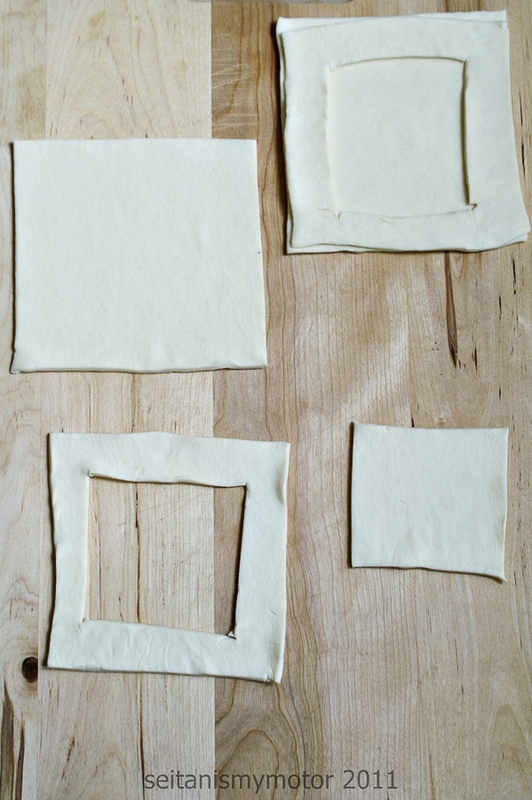 To prepare the puff pastry, cut square shaped holes into four of the sheets. Place them on the other sheets. Place 1/4 of mushroom filling in the centre of each sheet. Bake for 10-15 minutes or until golden brown. Tip: If you don’t have pumpkin seeds on hand, use 6 tablespoons of soy cream instead of the pumpkin seed cream. Of course you can make your own puff pastry sheets and use earth balance for those. Nice blog here. Amazing vegan recipes! but, about this post, arent puff pastry sheets made of all purpose flour and butter? How did you make these? They are store bought. Vegan puff pastry made with margarine is available at many stores. I’ve been on a bit of a slump too, so I understand– it’s just hard to keep up sometimes with the competing demands of life, work, and blogging. The puff pastry tarts look adorable and sound delicious. Well you’re handling your rut very well, when I get in a food rut I tend to consume a lot of cereal, so you’re definitely more then a few steps ahead of me. Those puff pastry squares look so dainty and delicious. You will emerge from the rut. Possibly with cookies. Don’t get down on yourself, Mihl! Ruts happen, you’ll get out of it when you want. It certainly seems like you’re eating well enough anyway, the pastries look delicious! Blog writer’s block is the worst, but I’d say you’re managing beautifully- I’d have never known you were suffering from a lack of inspiration based on these lovely offerings! I agree…so many wonderful blogs and recipes out there it takes alot of time up to try and view them all. We love mushrooms and what a great way to use them. I LOVE the name of your blog!! I’m obsessed with Cake. Those puff pastry sheets look incredible and I just happen to have a surplus of pumpkin seeds that I was trying to figure out what to do with. Thank you! I am glad they finally made another album. I have some more recipes on my blog that call for pumpkin seeds. Maybe they can help decrease your surplus. I didn’t use any seitan, but that is a very awesome idea! Oh YUM! I love what you’re doing with the pumpkin seeds here. They are super healthy, and I’m always looking for new ways to incorporate them into my diet. This looks like another fabulous recipe, even if it does stem from being in a blog rut. I can relate to the lack of blogging motivation; I’m struggling with it at the moment, too. But like you, I’m trying to get back into my cooking/blog groove by admiring the wonderful creations other bloggers share on their respective sites. There are just so many recipes to try or adapt, but not enough time or willpower to make much of a dent in the list. 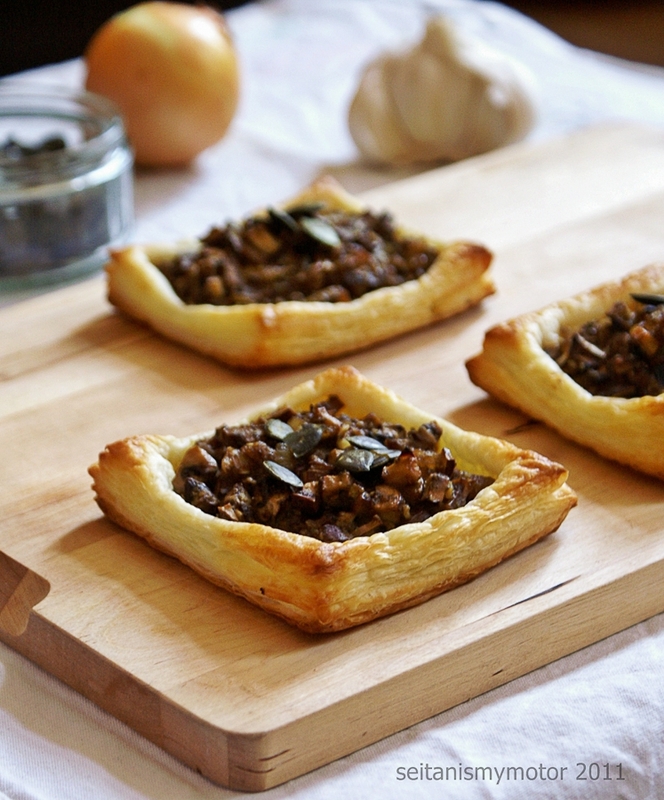 I’ve never made something savoury with puff pastry, but this looks really good. I know what you mean about not taking advantage of the huge recipe resource available. I bookmark recipes all the time, but most of them will never be cooked. Sometimes it’s just that much easier to cook something easy that you’ve made loads of time before. But that’s kind of boring. The soup looks lovely as well, but what’s lemon balm? Wow, if recipes like that come out of your blog ruts I’m impressed. I hope you do find some more recipe inspiration from your fellow bloggers. There are times when I have a whole list of posts ready to put online and weeks were I can barely bring myself to photograph another plate. I think it is okay to let blogging ebb and flow with life – although I do love reading your posts Mihl, so I hope there will be many more to come. Maybe you need to visit us in Toronto so you can post all about the trip! Bring Shellyfish too. I know all about food ruts and blog ruts and life overloads — that’s why I disappeared for two months. I think your idea of looking for cooking inspiration in the giant blog cookbook is a good one, though sometimes I just have to stop “thinking” about what I’m cooking and just cook the simple foods I love, and not worry about recipes and blog posts.